To the Brink of Cosmocide! 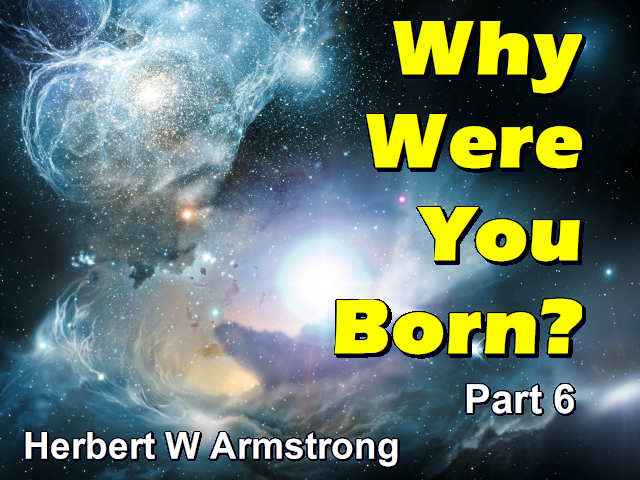 In the preceding program, "Why Were You Born?" We covered the why of it in the preceding program. You were put on this earth for a purpose — to become a born Son of God; one of the persons of the Kingdom of God. To share Christ's glory for all eternity, to be changed and made like unto His glorious body, for He is a divine Son of God by a resurrection from the dead. And by His resurrection He was the firstborn of many brethren and you were put here for the express purpose of becoming one of those many brethren. So that the apostle Paul said; "I reckon that the sufferings of this present time are not worthy to be compared to the glory that shall be revealed in us" (Romans 8:18). Yet we've been seeing that once converted, once begotten as a child of God the real struggle begins. Jesus said that many would strive to enter into the Kingdom of God and would not be able. Now we've been asking the question, why is it that God doesn't just take you immediately to your reward as soon as you confess Christ or profess Christ or accept Christ and profess Him before men — if that is all there is to it? And we have been seeing that there is a purpose in the Christian life. There is a reason why it isn't an easy life. Because what you are to be made, my friends, so far transcends anything that has probably ever entered your mind and it takes a great deal of preparation. And so the problem really of the Christian is how to grow, how to remain a Christian. How through the Christian life to grow into that marvelous, glorious destiny that God has in store for us. Very frankly I have often wondered. The thought has come to me at various times and I never mentioned it to a soul until just recently when I was talking to my wife about it. Whether I could have remained a Christian had God not brought me into His work where the pressure of the work continually drives me to my knees. If I get careless or begin in any way to let my mind get on material things or stray away from God, here will come someone in dire trouble or some tragedy, some emergency and I'm driven to my knees to pray to God for other people and for their troubles or their problems or something. And it keeps me studying my Bible, keeps me so busy in God's interest that my mind and whole interest is just simply almost automatically, you might say, kept in the things of God. I do not have time to let worldly interests or pleasures enter in like poisoned weeds to destroy what God has planted within by His Holy Spirit. Well the answer is, my friends, listen I could not — I could not remain a Christian. I could not go on unto that glory unless, unless even though not employed full time as an occupation in God's work, I had nevertheless kept my spare time filled with His work, with Bible study, with prayer and my mind on the things of God. And let me tell you something, my friends, neither can you. No man can really remain a Christian, no man can ever come to inherit that matchless, that indescribable glory that God has in store for us, unless he will keep his mind filled with the things of God; unless his whole interest and his whole pursuit is in the things of God. Even though he may have to have a job, a business or secular work to earn a living, surely, but God has also taken care of that. But when I mentioned this question to Mrs. Armstrong one time she smiled, as to whether I could have remained a Christian. She smiled and said that the answer as to whether I would, whether I would have remained a true and overcoming and a growing Christian had I not been called full time as an occupation into God's work as His minister was demonstrated during the three and half years after my conversion before I was ordained as a minister or before I entered the ministry. During those years I still had to earn the family living by secular work. And I was like most of you — I had a living to earn, I had my secular work that I had to take care of. And it took some of my mind too, because I was in the kind of work that did take mental work and I had to have my mind on it to a considerable extent. And yet during those years all of my spare time, all my real interest was in the study of the Bible and in God's work. And when I look back and I realize that that is where it had been, and many a time Mrs. Armstrong would call me to bed about one or one-thirty in the morning, I'd been up studying the Bible. And I began putting what I was finding and what I was reading into article form, because I had been a professional magazine writer. So it was just natural that, I never expected really at first, I never expected any of those articles ever to be published. But it was just my way of retaining it and you know when you write a thing down you remember it so much better. That's why in our Bible Correspondence Course, 'The Ambassador College Bible Correspondence Course' that we try to insist, of course it is up to you as to whether you do it. But we try to insist that every one of you who has enrolled for this correspondence course will write down all the answers. And that you will write down the scriptures. Now you can read those scriptures in your Bible, but we ask you to write those scriptures down in your own handwriting. Copy them out of the Bible that answer these questions. Put the question there. Write down the answer. Write down your own comment explaining that answer. Do you know why we want you to do it? When you write it down you have really got it — you have made it yours and it belongs to you and you won't forget it. That is one of the best ways to remember what you study and what you read in the Bible. Well my writing in those days was more for that purpose than anything else. Now to be and to remain a Christian then there are two requisites that are absolutely necessary. First is you must have a goal. Listen even in secular business, my friends, the very first principle of success is to have a goal, to have an aim. You probably will never hit as high as you aim, but if you are not aiming any place, if you have no goal you just aren't going any place. You must have a goal and you must keep your eye on the goal. As a young man back in school days I use to engage in athletics. I think I went out for about everything; football, baseball, track, ice skating, basketball — about everything, I think. You know we had something that is almost an axiom in any athletic sport and that is "keep your eye on the ball." You take your eye off the ball you're lost. If you play tennis, as the ball is coming toward you, if you take your eye off the ball and look at your racket as you're going to hit the ball, you aren't going to hit the ball where you want to. If you play baseball, you have to keep your eye on the ball. Now that is a good slogan in any business. It is a good slogan in the Christian life. But you've got to know what the ball is. The ball isn't always an actual ball like a baseball or a tennis ball, or a, what do we say, a ping pong or a table tennis ball. The ball is your goal and in this case you have to know what is your goal? What is the overall goal? Listen your job, your work — that's only temporary. You aren't going to be doing that for eternity. That's only for this life. Haven't you got a goal bigger than that? Now then if you are in a secular job, and if you want to be successful in the usual sense of the term, even in your occupation you must have a goal. And if you don't have it you are not going to succeed. And the Christian must have a goal or he will never succeed and then that's the ball, so to speak; the figurative ball on which he must keep his eyes. And if you get your eyes off of it, my friends, you are going to start to sink. You know I'm just reminded of an experience. I don't want in any sense, of course, to call Jesus Christ a ball, that was only a figurative expression, but there was a time when the ball that Peter had to keep his eyes on or the objective, let's use that word which is much better. The real source, the real objective was Jesus Christ. And Christ had come walking on the water you remember and Peter wanted to walk on the water, so Jesus told him to do it. So he got out and he actually started walking on the water, believe it or not. It's in your Bible (Matthew 14:28-31). He had his eyes on Christ, he was looking at Christ and as long as he did, as long as he looked at Jesus he was walking on that water. A miracle was taking place, because as long as his eyes were on Jesus Christ, why he had perfect faith. He could trust and he just didn't think of any dangers, there was no fear, there was absolute faith — he was walking on the water. But then, he took his eyes off of Christ and he looked down at the water and he began to sink immediately. My friends, you need to know what you need to keep your eyes on and never take them off. Now that is the first secret of success and the minute you forget what your real goal is, your real objective, your real purpose. The whole purpose of the apostle Paul's life, his whole goal was to attain unto a certain objective; the resurrection of the dead. "Not as though I had already attained, either were already perfect: (Philippians 3:12). Because you have to become perfect in the resurrection of the dead; now you have to strive toward that goal in this life and when you are changed to immortality, when this mortal puts on immortality and you are born into the Kingdom of God a great change is going to take place. And you will then be perfect. So Paul said: "Not as though I had already attained, either were already perfect; but I follow after, if that I may apprehend that for which also I am apprehended of Christ Jesus. Brethren, I count not myself to have apprehended but this one thing I do, (Philippians 3:13). The resurrection of the dead. In other words entering the Kingdom of God. In still other words being as so many people popularly say it, becoming saved; coming to the ultimate glory that God has in store for us. Now that was Paul's goal in life and it must be the one overpowering purpose in your life. Salvation; entering the Kingdom of God, but very few people know what it is. Very few people know what God has in store for those that love Him. And I want to tell you it transcends what you probably have had in your mind — as far as the height as the greatest height of the heavens is high above this earth. Now it is a calling, it is a profession — something you have to work at. You have to devote yourself to it. It must just fill and flood and occupy your mind. You are admonished in the scriptures "make your calling and election sure" (II Peter 1:10). Yes there is something you have to do. Listen, the eternal life comes from God. You are not going to have the power and the strength to live a perfect life, but you can come to that throne of grace and you can find all the grace to help in the time of need that you may require. It is a life calling. It's an occupation, it's a profession. And then remember "let him that thinketh he standeth [says your scripture] take heed lest he fall" (I Corinthians 10:12). And so my friends what is then the way? First you have to have the goal. Second is the way to attain that goal, now what is the way? What do you need now in a Christian life to go on to reach toward and to finally achieve that goal? There is something you have to do. Of course one of the things you have to do is to cry out to God for help, for power, the things that God will do if you ask Him. Yet there are many things that you must do. You see you're sort of like a partner of God in this thing and He has given you your part to do and God isn't going to do His part until you do yours. Now what is that way? How are you going to prevent falling? Because you can fall. Now the second thing is going to work on your own self. First is your part in the work, your activity in the work and second is your activity in developing yourself. There you have to first overcome and secondly, you have to grow spiritually. But those that are selfish enough to just try to, well, overcome and to grow spiritually themselves and they don't want any of the unselfish part of the collective co-operative work that God has given us to do in the great commission that He has given us collectively to do — I have always noticed that those people sooner or later, usually it is sooner, fall by the way side. They do not endure. And they can't work out the second part. And God has given us, every one of us together, as co-workers together in His work, in His great commission; He has given us a job to do. That keeps us on the job, that keeps our hearts in Him and in His work and in the objective that He has set before us. And there is a great reason why He has given it. One of the quickest ways to lose your salvation; remember this "let him that thinketh he standeth take heed lest he fall" (I Corinthians 10:12). One of the surest ways to fall is get your mind off of the work of God. The collective work in which you share with your part the same as I do with my part. So it is the easiest neglected yet it is going to keep you in the second phase of it or the part of going to work on yourself. Now even though you are not called to full time service as a minister, even though you are at labor in secular work, some profession business or something to earn a living — still you must put God first, my friends, in your life and if you don't you are never going to finally achieve salvation. If your whole heart, if your main interest is first in your business, your profession or your secular work and that is the number one interest of your heart — or secondly, if the number one interest of your mind and heart is the proceeds of what you hope to get out of such a work or such a business by saving money or getting money as you go along for the pleasures of this world, or for the things that money will buy, for secular things for material things. I say that in either way you are never going to enter that glory to be a co-heir of Jesus Christ and finally a co-inheritor and possessor of the glories of the Kingdom of God. Does that mean then that you are not to give any thought to your job, your work? Why not at all. Not at all, you can give it all of the thought that is necessary and remember, my friends, that God has said whatever you set your hand to do, do it with your might (Ecclesiastes 9:10). And if you have heard this program very long you know that one of the things that I continually preach is that you must, if you serve a man, serve him to the very best of your ability. If you employ a man then think of his interest too and try to look out for that. Try to see that you are even serving your employees as a good Christian should. If you make something, put your heart in it of course. Make it the best that can be made. You know I want to tell you, my friends, that neglect of that very principle is one of the great curses of the United States of America today. Today we are so dollar hungry that the idea is to get big volume. Big volume sales and give the cheapest product you can. Get as much for it as you can. Give as little as you can. That's why I say so many times that we are going the way of ancient Rome. We are headed for the biggest fall that ever hit a people if we can't wake up. That's why it is that if you want the very best of some things you have to get those things that are marked with that little magic word 'imported.' Because in some of the foreign lands they still take pride in their work. Now I don't for one minute mean that you should slight your job or your work. You can do that very faithfully. You can do it the best that can be done and still your great overall overpowering purpose in life and the one thing that really is your great heart interest can still be the things of God and the work of God. Now God knows you have need of those things so just listen. "Is not the life more than meat and the body more than raiment [or clothing]? Behold the fowls of the air they sow not [they don't go out and plant seed, they don't plow up ground] neither do they reap nor gather into barns; yet your heavenly Father feedeth them. Are you not much better than they? Which of you by taking [this kind of] thought [this anxious, worried thought that dominates your life], which of you can add one cubit to his stature?" (Matthew 6:25-27) Or shall we say one inch in modern American language. My friends, it took me a great many years to learn that lesson the hard way by experience. I started out putting all my heart and all my interest in mammon. In the things that would feed and clothe and shelter me and give me amusement and entertainment, and that would exalt my pride and vanity of being successful in the business world, as I fully expected to become. I was willing to pay the price and I was quite successful as a young man. I was making a great deal of money and I was earning it. I had to give all of that up and when I put it secondarily and as a matter of fact in my case I put it about out completely, because my life finally came to be completely given over to and devoted to God and to His work. And I frankly never expected to be able to have anything and for years we didn't. And we had to work and work as hard as if I had been the executive head of a good size corporation. And there were years while we were learning our lesson and while God was bringing us to Him that we didn't have enough to eat and we know what it is go hungry. And then there were years after we found God we still had a hard time until we learned the lesson about tithing. From the very moment the very day that we began tithing, later that same day, enough food came and we have never been hungry since — never. You know God set a law there in motion. Even though we had, I had been converted and given ourselves to God, I didn't fully understand God's law of tithing and as a result of not fully understanding we were a little careless about it and we weren't tithing as faithfully as we should, and we were still going hungry on occasion. God let us learn that lesson the hard way and when we learned it, we have never had to go hungry since. Now God said "seek ye first the kingdom of God and His righteousness" and we did. Well it was a long, slow, hard climb and for years we had very little. And all of the brethren that we knew up in Oregon in the early days of this work — I won't say all of them but I will say that a large portion of them — lived better than we lived. They had better things than we had, they drove better automobiles than we did, but God says "seek ye first the kingdom of God and his righteousness and all these things [these material things] shall be added" (Matthew 6:33). And God is faithful and I have found Him faithful. You know God doesn't want you to be poor. God wishes above all things that we might prosper and be in health. God prospered Joseph and he was a prosperous man and God prospered everything he did because he trusted God and obeyed God. But as David said, if God does prosper you, if He does add those things after you have sought His kingdom and His righteousness first, he says don't set your heart on the prosperity (Psalm 62:10). But be grateful and thankful for it as a gift from God try to put it to His use and to His service and use it in His work and to His honor and glory and He will bless you in it. You know there was a great material gift that God had bestowed and that was the birthright that was bestowed on Esau. It came by birth, by natural birth to Esau. But Esau didn't evaluate it properly — he undervalued his birthright and when the going got tough he was willing to sell that whole birthright for a little bowl of red soup. Because that is what he got from Jacob. Now the church is the body of Christ and He has given us a great commission. And He has given us a way to put our hearts in the kingdom of God in getting the message of the kingdom of God to the world because that is the message and that is the divine commission. Go into all the world and preach the gospel the gospel of the kingdom (Mark 16:15). And Jesus said of our time "this gospel of the kingdom shall be preached and published in all the world as a witness unto all nations (Matthew 24:14 paraphrased). My friends that's the first thing we should have our hearts in — is that great goal.